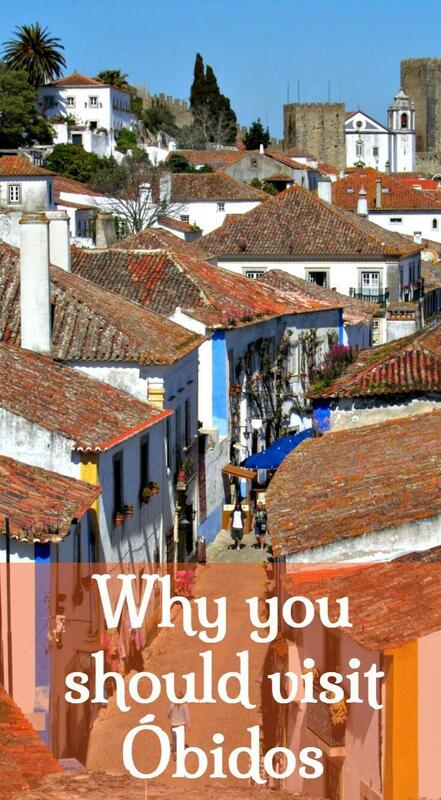 If you’re looking for a small, attractive medieval town that’s not too far from Lisbon, try Óbidos. Most people go there as part of a day trip but I also enjoy the peaceful experience of staying overnight. As well as the various things to do in Óbidos itself, including tasting the lovely ginjinha de Obidos, there are other attractions in this part of the Silver Coast, including the gorgeous beaches at Foz do Arelho lagoon, so you could consider using it as a base for a longer stay if you have a car. 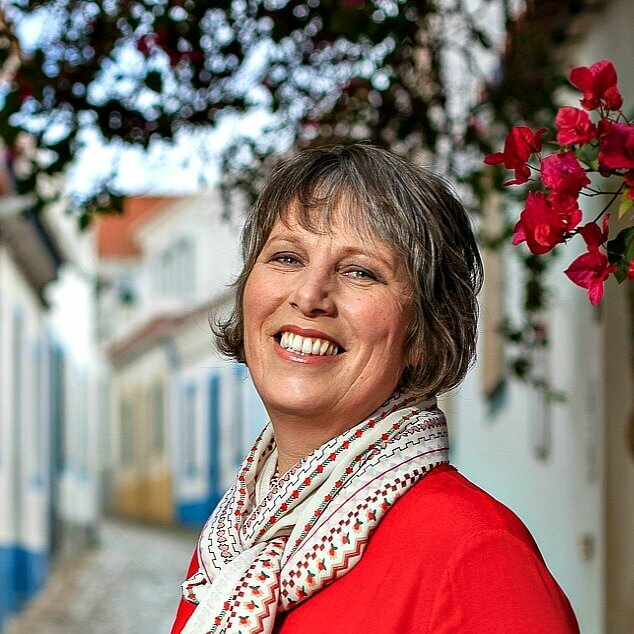 One of the greatest pleasures of visiting Óbidos is wandering around its cobbled lanes, especially away from the main thoroughfare that is Rua Direita. Venture along any lane to find tiny whitewashed cottages trimmed with blue and yellow paint, often with low arched doorways or stone ledges and steps that have been there for centuries. Some have been here since the Moorish occupation which ended in the 12th century. Look out for the sign off Rua do Facho pointing up a set of steps to the Miradouro (viewing terrace). As an incentive, Esplanada Miradouro café bar awaits you at the top. Unless you’re staying at the luxury Pousada inside the castle, you’ll only be able to admire this medieval fortification from the outside. The Obidos castle grounds are the site of many of the town’s annual events (see below), during which you’ll need to pay to enter. Otherwise, you should be able to go through the grand arched gateway and walk around the gardens. If the weather or lack of safety rails don’t put you off, you can walk the walls at any time of year but be careful! The full circuit is 1.5 km and offers fabulous views of the cute historical centre and surrounding countryside. As if the charms of this pretty town weren’t enough to attract visitors, Óbidos knows how to host a good festival. Every year, the castle grounds and public squares are taken over by fun events such as the Chocolate Festival, Medieval Fair, Opera Festival or Christmas Village (Vila Natal). It can get a little crowded when these events are on, especially at weekends, but even then it’s possible to find quiet cobbled backstreets if you can’t cope with the sea of people on Rua Direita. Tip: If you can go to these festivals on a Friday instead of Saturday or Sunday it should be calmer but check the programmes and schedules first to make sure you don’t miss anything (or the entire festival like I did back in 2011!). Aside from the obvious castle and walls, there are other architectural features to admire in Óbidos. One is the 16th century aqueduct outside the walls. 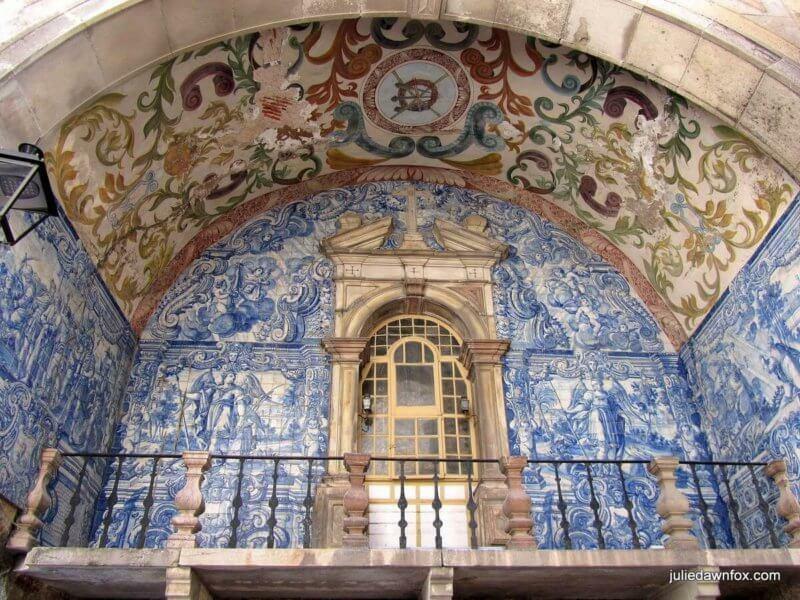 Another is the Porta da Vila, the double-arched main entrance to the old town, richly decorated with 18th century tiles and a painted ceiling. There’s often an elderly lady sitting here doing and selling embroidery. Among the churches and chapels, one to note is the little 14th century shrine inside the Capela de São Martinho (near Olaria de Óbidos shop). The main church of Santa Maria is in the square just below Rua Direita. 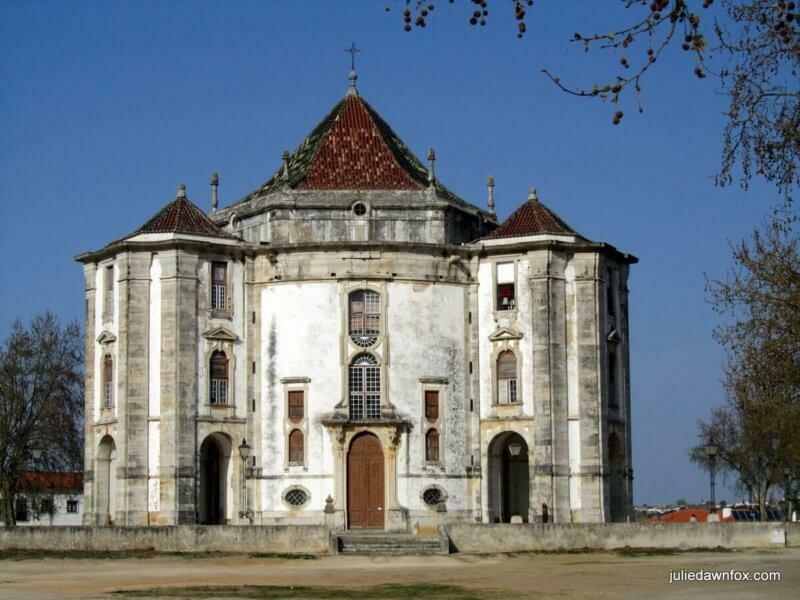 This is where the young King Afonso V and his child bride and cousin Isabel I were married in the mid 15th century. (When I tried to check ages and dates, I found so much conflicting information that I’m reluctant to pick any numbers.) What’s indisputable is the quality of the painted barrel ceilings and the blue and white painted azulejos that decorate the walls. Before leaving the square, take a moment to notice the 15th century pillory to which wrongdoers would be tied naked for public humiliation and punishment. The street that leads off to the right of the square holds the 16th century Igreja da Misericordia, also worth a look for its tiles and painted columns. The adjacent 16th century tower was originally part of the castle but now offers accommodation. The massive Baroque church you can see from the town walls is actually a sanctuary, namely Senhor Jesus da Pedra. The name stems from the legendary stone cross bearing a sculpture of Jesus which is located near the altar. According to the most popular version of the story, during severe droughts in the 1730s the long-lost 15th century cross was rediscovered by a local farmworker. The cross “demanded” that he worship it and as soon as the labourer obliged, the long-awaited rains came. When I visited, the doors were closed so I was only able to admire the building from the outside. One of my favourite Portuguese liqueurs is the cherry brandy called ginjinha and the one from Óbidos is renowned for its quality. Ginjinha bars may be popular in Lisbon but there’s no escaping them in Óbidos, especially during festival periods. If you buy it from a streetside stall, you can either have it served in a chocolate cup which you get to eat or in a plastic or ceramic keepsake cup. The atmospheric Bar Ibn Errik Rex on Rua Direita serves a generous glassful of ginjinha. It’s also a good place to try flame-grilled chouriço. Among the general tourist tat, you’ll find some excellent quality crafts and souvenirs in Óbidos, especially on and around Rua Direita. One of my all time favourite shops is Olaria de Obidos, which sells modern ceramics and quirky artworks. Ana Alpoim’s is another great find for fashion and unusual accessories – it usually has a decorated bicycle outside. Book and healthy food lovers should head for Mercado Biológico de Óbidos which sells organic produce in a book-lined store. The lagoon-side beach at Foz do Arelho is possibly one of my favourites in Portugal. Unlike the waves on the windy ocean beach next to it, the water in the lagoon is calm and slightly warmer than the sea. It’s still patrolled by lifeguards in summer and is understandably popular with families. If you’re hungry, there are several beachfront bars. I’ve eaten twice at the glass-fronted Cais do Praia and would go back. Baleal beach, near Peniche, is another good option, especially if you like interesting rock formations. See this post for more information. While it’s possible to ‘do’ Óbidos in a couple of hours, I’m all for slow travel. I’ve stayed overnight a few times, mainly because of the festivals, and the atmosphere changes at night. During events, the streets and bars are still lively but during the week, it’s almost deserted. If that appeals to you, consider staying inside the ancient walls. 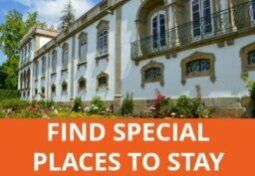 There are plenty of accommodation options in and around Óbidos. If you are driving, don’t bother trying to drive into the old part of town. You’ll find parking areas just outside the walls. There is a train station but if you’re coming from Lisbon, you’d be better off taking the bus unless you’re driving or coming on an organised tour. The RodoTejo Verde (Green) bus from Campo Grande station takes just over an hour. Note that the stop is on Rua Actor António Silva just outside the main terminal – head for the green apartment block. There are several tours from Lisbon that include a couple of hours in Óbidos as well as a whirlwind tour of nearby towns and sights. 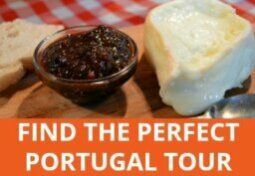 Try this small group tour by Cooltour Lisbon, which also includes time in Fátima, Batalha and Nazaré. We are planning to spend one night in October and your tips will certainly come in handy. We are both so looking forward to it. Thank you. I’m sure you’ll love it, Joanne. We are planing an extended stay in Portugal, possibly a year or two, maybe longer. Would you suggest Obidos as a place with low rent ( less than 600 Euros) and easy access to market for food? Is there public transportation there? I’d imagine that Caldas da Rainha would be cheaper, easier to get to and it has a daily fruit and veg market in the main square. It’s not far from Obidos. We stayed at The Literary Man Óbidos Hotel last September, 2016. It was the worst stay of our month-long trip. Our room smelled horrible (like sewer) and we were worried about a hotel fire all night. No smoke detectors and the walls are lined with wood strips and totally covered with paperback books. Very unsafe and a fire death trap!! The desk girl didn’t seem to care much about the odor in the room and just said she would tell housekeeping when they next arrived. Just thot you and your readers would want to know. Thank you for your article about Obidos. Very inspiring! Tell me, please, what happens there on Sundays? 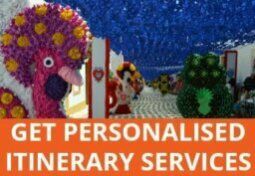 Are there many tourists, do souvenir and ginjinha-shops work? I would like to make a love-story photo session here, but I noticed that on our trip we will be here from Saturday evening to Monday morning. A little worried. Hi Rita, The souvenir shops and ginjinha places will be open on Sundays as it’s one of the busiest days for tourists so you should have no problem getting some good shots. You’ll have some quiet times, too, which will provide a pleasant contrast. 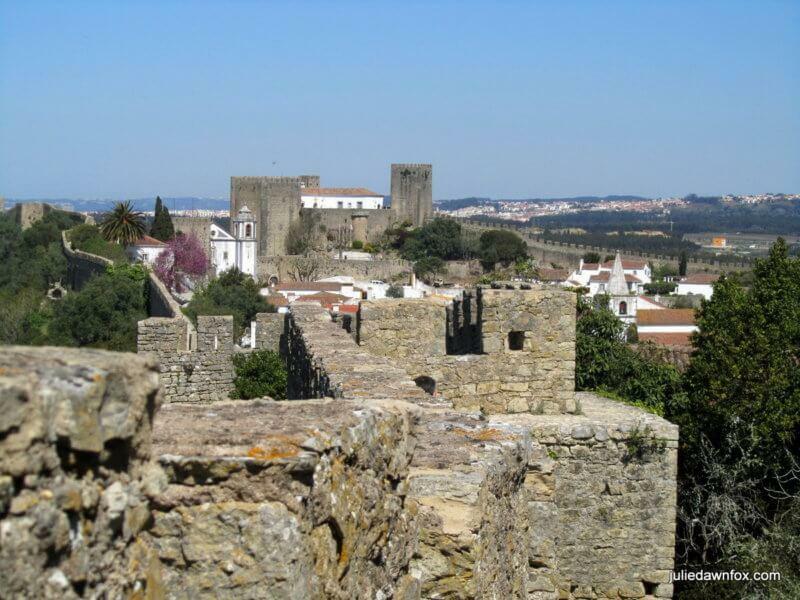 Obidos is a little gem.Great article Julie. One of our favourite places to visit(and drink ginginha). Hope to be tthere again in Feb/Mar. Yes, it’s one of those places that’s always good to go back to. Have fun, Frank. I visited on a weekday during the Chocolate Festival a few years ago and was surprised at how many places sold chocolate as well as how quiet the whole village was. I think it’s busiest at weekends then. So walking the ramparts was easy and exciting and the back streets were practically empty and wonderful to wander through. Glad to hear it, Anita. It’s a charming little place and I love the fact that you can easily give other tourists and visitors the slip and find peaceful streets to explore. You’re welcome, Barbara. Have a great time! As always Julie your blogs are so descriptive. I can’t wait to visit some of the lovely places you have described. Had 24 hours there last May with a overnight stay at Casa das Senhoras Rainhas hotel, which was lovely. The staff were brilliant. The Rua Direita was very busy but away from that one street, it was exceptionally quiet. I’d definitely recommend a visit. The motorway is nearby so it’s a decent place to use as a base. The only thing to be wary of is parking if your hotel is within the city walls. It wasn’t designed with cars in mind so best to know whether a) you can park and b) how to get to your hotel before you arrive! Hi Pete, glad to hear you also enjoyed Óbidos. And thanks for the tips about parking – I’m working on another article about where to stay in Óbidos and plan to mention that but it’s helpful for people to see it here, too.